This book is one of the great classics of chess literature. The author, Imre Konig, was an International Master of Chess and a great analyst as well as an entertaining writer. He describes the development of chess opening theory and discusses lines of play no longer in vogue but which remain powerful weapons for the practical tournament player. 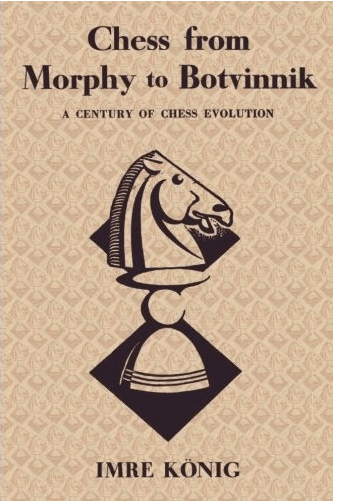 This book was originally published in 1950 as "Chess from Morphy to Botwinnik". The title has been changed to conform to the standard spelling of the name of Mikhail Botvinnik, who was World Chess Champion three times: 1948 to 1957, 1958 to 1960 and 1961 to 1963. About the Author(s)Imre Konig was awarded the International Master title by FIDE in 1951, the first year that these titles were awarded. He is rated 2440 in Elo's book, "The Rating of Chess Players, Past and Present" ISBN 0923891277. However, he was better known as a writer and an analyst than as a player.